The curtain rises on a star-crossed galaxy far away, this time revealing the tragedy, hubris, and doomed romance that will lead to the fall of the Republic and the rise of an Empire. In Episode III, the prequel chapters of the Star Wars saga climax with this tragic tale of a once-heroic knight's transformation into the darkest of villains. Masterful meter, Shakespearean soliloquies, and intricate Elizabethan illustrations will leave more than a few readers convinced that the Star Wars epic sprang straight from the Bard's quill. 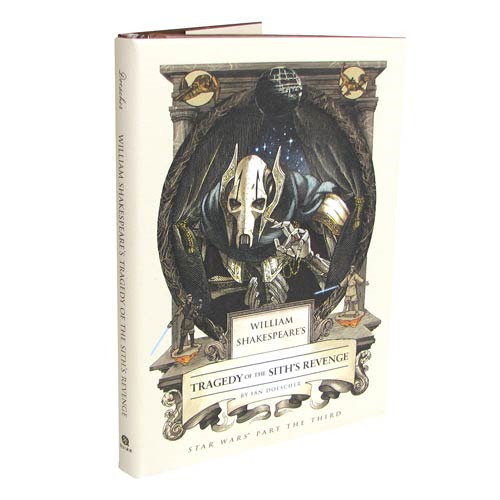 The Star Wars William Shakespeare's Tragedy of the Sith's Revenge Star Wars Part the Third Hardcover Book from Quirk Books has 168 pages of excitement. Measures about 8 3/10-inches tall x 5 7/10-inches wide. Ages 14 and up.